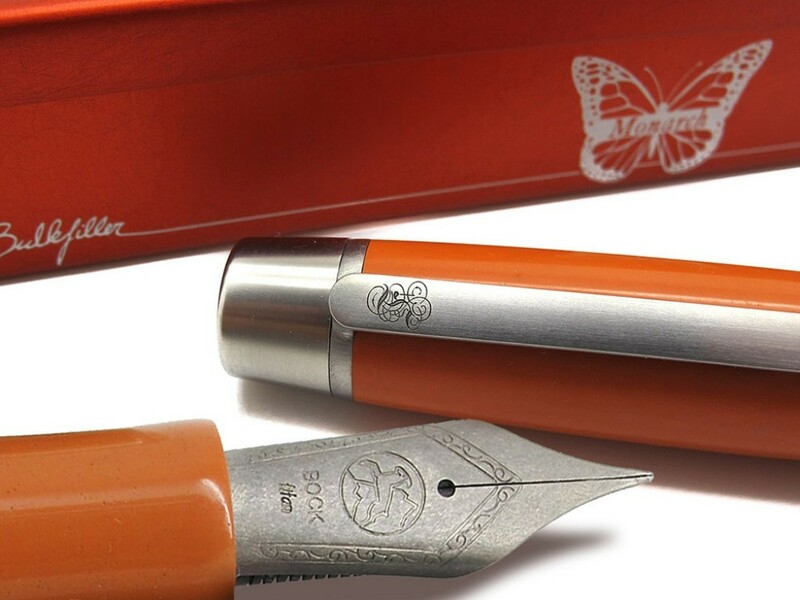 In a cooperation with the Dutch fountain pen shop Fontoplumo, this pen pays homage to orange; a colour symbolizing the lively and warm-hearted national spirit of the Netherlands and their Royal House of Orange. 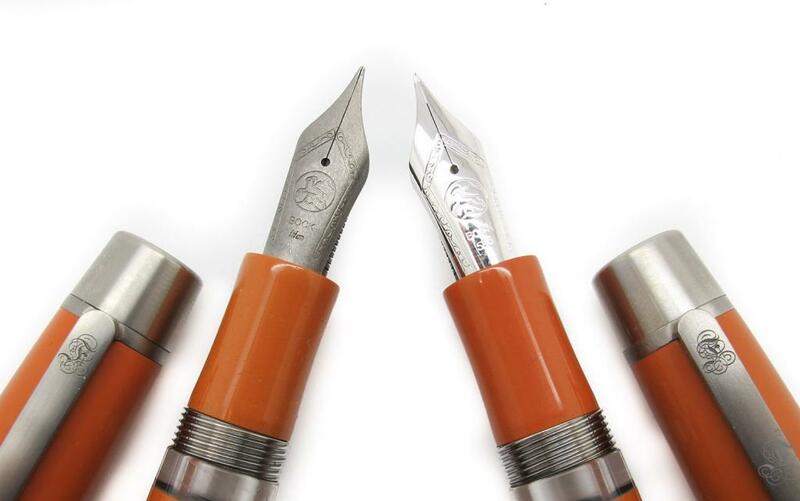 The story of the Monarch fountain pen began back in March 2015 at the Cologne pen show in Germany. Both Conid and Fontoplumo had a display over there. After several inspiring conversations with Werner Helsen, the CEO of Conid, Frank Van Krieken, the owner of Fontoplumo was invited to the Conid factory for a guided tour. As a true Dutchman, he was wearing a bright orange jacket that day, which immediately captured Werner’s imagination. 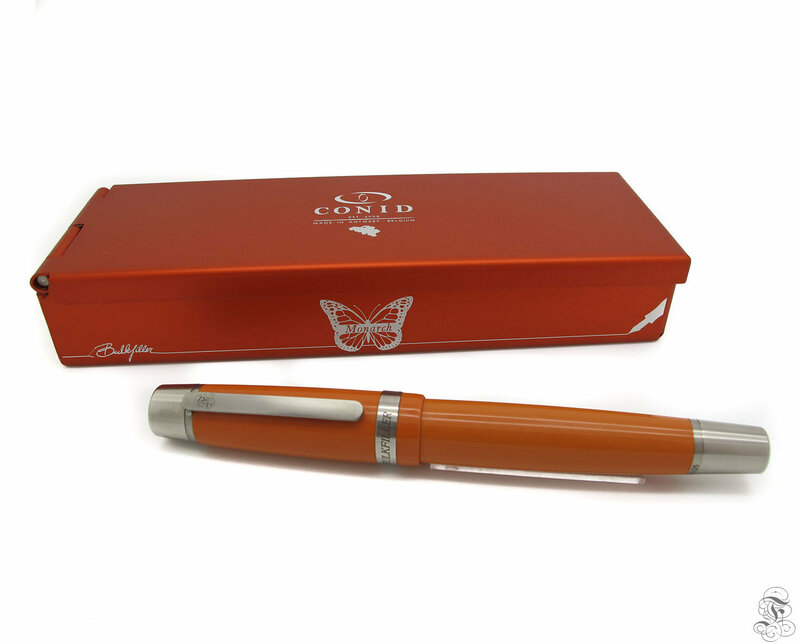 With this pen, Fontoplumo and Conid pay homage to orange, the colour closely associated not only with the people of the Netherlands but also with their royal house. According to legend, pioneers from Europe, especially those from Holland and England, who crossed the Atlantic to settle in America were awestruck at the sight of beautiful orange butterflies. Consequently, they named the species Monarch after William of Orange, the king who also was William III of England. The butterfly is also the symbol of metamorphosis. This Bulkfiller is therefore designed with equal elegance and delicacy as a butterfly, contributing to the user’s braveness to transform into the finest version of oneself. 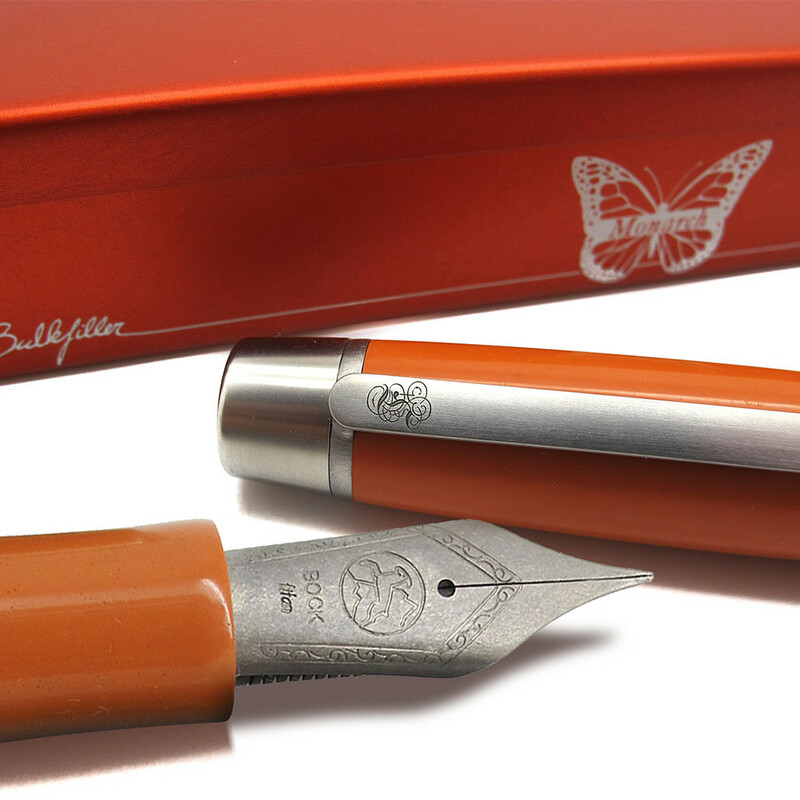 As its ebonite covering in intense warm orange, this limited edition is made to fulfil the ambitions/aspirations of both its creators as its users. This Bulkfiller comes in two designs. 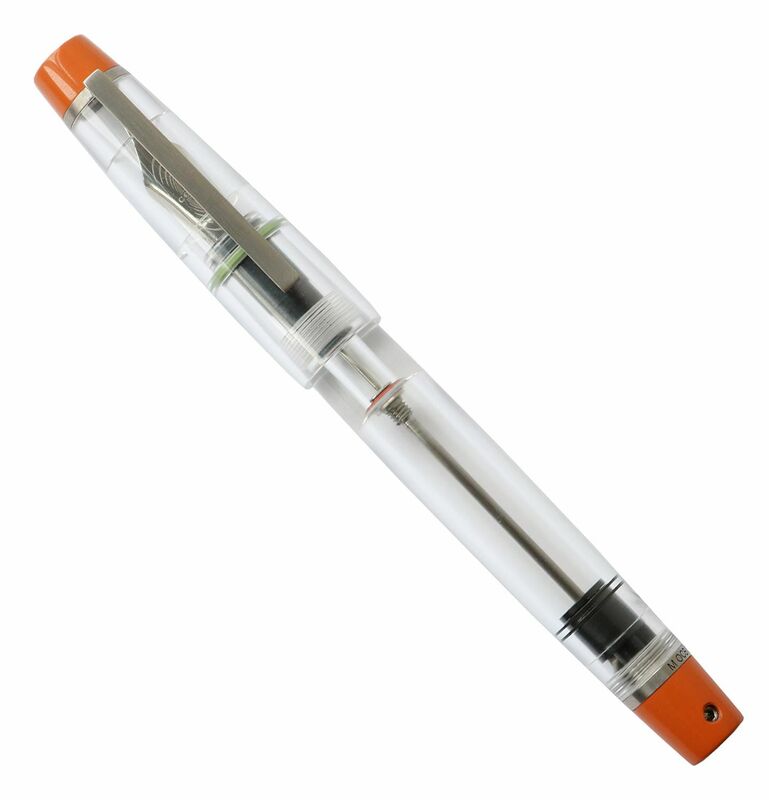 This Kingsize model holds up to 3 ml of ink and fits the royal allures of the pen’s story brilliantly. 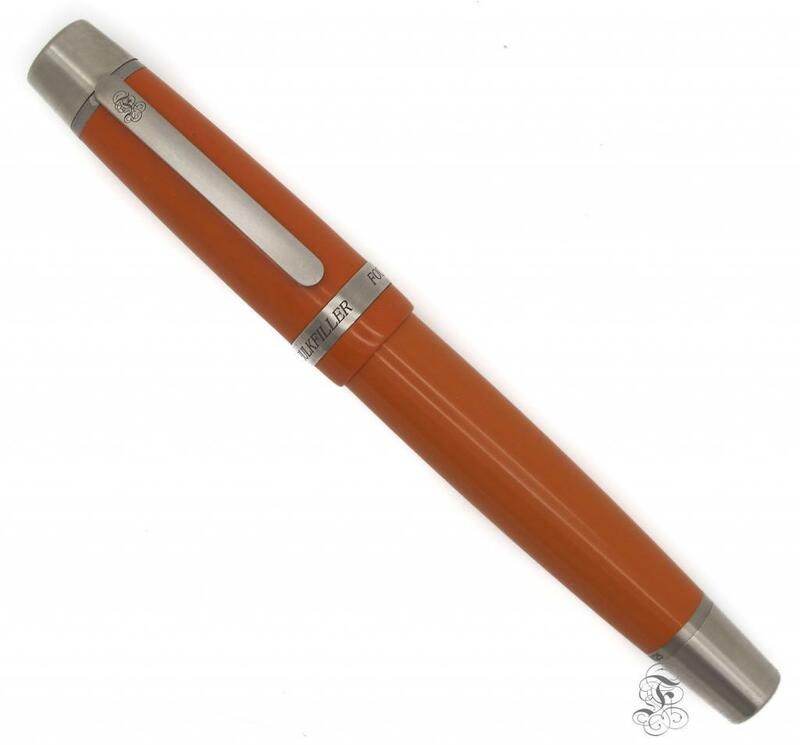 Next, the pen is also available as a Minimalistica with a demonstrator barrel and an orange celluloid top and end. Holding up to 2.5 ml of ink, it is slightly lighter and more streamlined than the Kingsize model.